Lump Sum Or Dollar-Cost Average? You have a difficult job. Placing your hard-earned cash into the markets with no guarantee of return or stability is not something to take lightly. But it’s usually the best way to achieve lifelong financial goals. How can I say this confidently? Let’s look at the numbers. Since 1961, the S&P 500 has increased on an annual basis 72% of the time. This means if you randomly invested in any month during the last 55 years, you would have made money over the following year nearly ¾ of the time. This makes sense when you consider what the market represents: A broadly diversified ownership of the economy. And the global economy has experienced long-term growth consistently since the beginning of time. However it isn’t so easy to get started if you have a lump sum sitting in your bank account. Many people say you should “dollar-cost average” (DCA) meaning put a little money to work each month until you are completely invested. But knowing the market goes up 72% of the time, should tell us this is a bad idea – even though it’s so very popular. Again, let’s turn to the numbers. As the table above shows, an investor who decided to dollar-cost average over a short 3 month period (investing evenly each month) was better off only 38% of the time vs. a similar investor who simply put all her money to work in one month. Taking even longer makes it worse. An investor who decided they needed 2 years to work-in to the markets performed better than the “lump sum” investor just 26% of the time. What about delaying altogether? After all, we can often convince ourselves the market seems a bit lofty so perhaps we should wait for a “correction” before putting any money to work. The problem here is that no one knows whether a correction will come and the odds are always stacked against it. The table above further shows that an investor who decides to wait also underperforms the one who dives in immediately. 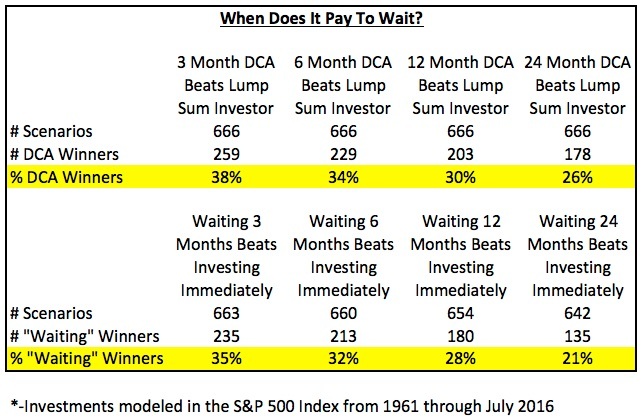 In fact, waiting just 3 months to invest will only win out 35% of the time, while waiting 2 years wins a feeble 21% of the time. But don’t think of investing as an “all or none” game. Your financial plan should account for needed day-to-day funds as well as an emergency fund that is set aside and readily available. Trying to game the markets with your remaining funds – your true investment funds – is where the danger lurks. Remember, your financial plan is much more important and comes far ahead of any investment strategy!